Bon Bini! Welcome to our One Happy Island, Aruba. The word is ours but we like to think the meaning is universal. Warm rays make your skin shimmer with delight while the soft northeast trade wind caresses you in to cool comfort throughout theOne perfect day Upon disembarkation you will soon begin to notice the smiling faces everywhere. While our official languages are Dutch and our native Papiamento, most Arubans are fluent in English and Spanish. In our continuous efforts to provide comfortable and practical accommodations for our cruise ship guests, two cruise terminals have been created where you will find a wide array of services and shops selling perfume, Dutch delicacies and Delft items to local and Caribbean handicrafts and souvenirs. Once you have entered our air-conditioned terminals we encourage you to visit the friendly and hospitable staff at the information booths, where they are waiting to assist you with all the information you need to begin your adventure in Aruba where you will discover the unexpected. 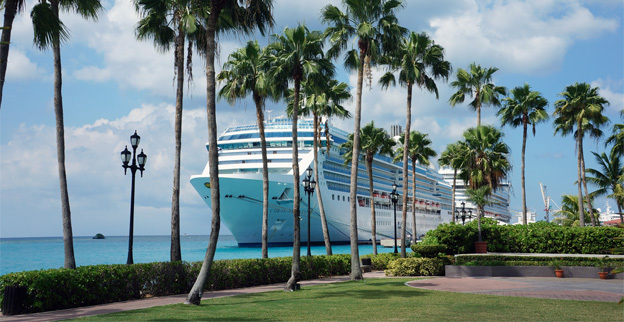 At a very short distance from the Aruba Ports Authority terminal, cruise passengers will have the unique opportunity to stroll unhurriedly through numerous fashionable stores that are stocked with imported merchandise and luxury items at excellent prices. The island’s Main Bus Terminal is located across the street from the Cruiseterminal. Taxi’s offering private tours are also available outside of the terminal. Aruba Tour Operators Association (ATOA) busses are located on port premises. Independent Tour Operator buses are located right outside the terminal. Vehicles can be rented outside the terminal. SETAR N.V. has a kiosk located at the Cruise Terminal where they provide international call services, Wi-Fi cards, and Internet Services. An ATM machine is located within the terminal, across from the visitors information booth. The teller dispenses American Dollars and Florin/Guilder (local currency).